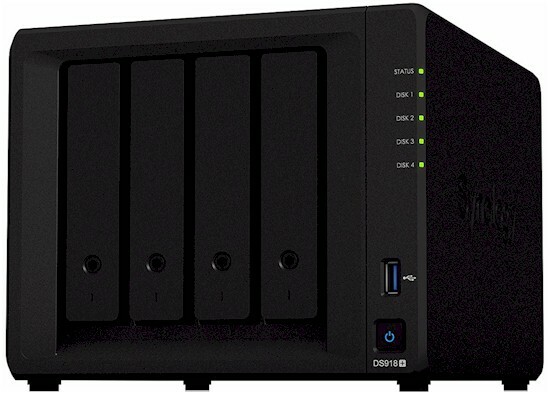 In this review, I'll be looking at the Synology DS918+ DiskStation. Synology describes the Plus Series as "Engineered for high-performance and data-intensive tasks, designed to meet on-the-fly encryption and scalability demands". That description perfectly describes the DS918+. I'm going to compare the DS918+ with the recently reviewed DS418j. It might seem counterintuitive to compare the Plus series DS918+ to the entry-level DS418j, but it's not. While the DS918+ costs almost twice as much ($550) as the DS418j, both products earned excellent rankings in our NAS Ranker. The chart below, generated from the NAS Finder, compares the major features of the two Synology NASes. You can see the DS918+ has a significantly beefier hardware lineup across the board. Its platform includes a quad-core Celeron J3455 processor with 4 GB of RAM (upgradeable to 8 GB), dual Gigabit Ethernet ports with load balancing and failover and an eSATA port that enables expansion to 9 bays total with the addition of the DX517 expansion chassis. The drives are hot-swappable and the DS918+ also has two slots for M.2 NVMe SSD cards, so you don't have to give up drive bays to get SSD caching. If you want to read about the performance benefits of SSD caching, Synology's white paper is well worth reading. By comparison, the DS418j is powered by a dual-core Realtek processor and has 1GB of non-upgradeable memory. It has a single Gigabit Ethernet port, the drives are not hot-swappable and lacks an eSATA port for expansion or backup. As with most of Synology's higher-end NASes, the DS918+ supports the BTRFS file system in addition to the standard EXT4 file system. The BTRFS file system allows you to create up to 256 recovery points with very little storage overhead. Synology's BTRFS white paper has more info. The callouts and LED indicator key chart below shows the front and rear panel layouts for the DS918+. The front panel has a single status indicator and has indicators for the four disks. There's a single USB 3.0 port on the front panel as well as the power button. The rear panel has dual Gigabit Ethernet ports, each with status indicator LEDs, an eSATA port, the second USB 3.0 port, and a power port. For 3.5" drives, you don't need any tools for installation. You just remove the lockable drive trays and secure the drives in the drive tray with plastic fastening panels that snap into place. Disk installation is covered in the Hardware Installation guide. The disassembly of the DS918+ proved to be a bit challenging so we don't have a photo of the main PCB. However, iFixit has a complete teardown of the DS918+. The screenshot below was taken from Step 19 of their teardown. Even though disassembly of the DS918+ was moderately difficult, Synology made it fairly simple to upgrade the memory without case disassembly. You can access the empty memory slot by removing the drives. This is covered on pages 8-9 of the Hardware Installation guide. Note: If you upgrade the memory after you have initialized, be sure to label your drives so that you can re-insert them in the correct order. Similarly, Synology made it simple to add one or two M.2 NVMe SSD modules to the DS918+. The SSD slots are located on the bottom of the DiskStation. Page 10 of the Hardware Installation guide walks you through the upgrade process. The DS918+ drew 26 W with four of our stock WD Red 1 TB (WD10EFRX) spun up and 13 W in power save mode with the drives spun down. Fan and drive noise was rated very low. RAID 5 build took 2 hours and 10 minutes with bad block check skipped.